BRASILIA (Reuters) - Brazilian President Jair Bolsonaro could be discharged from the hospital on Wednesday but it will depend on a medical evaluation of his recovery from surgery last month, his spokesman said. "As of (Wednesday) he will be able to be discharged," presidential spokesman Otavio Rêgo Barros told Reuters on Tuesday. "It will depend on a medical evaluation." Bolsonaro has been hospitalized since Jan. 27 at the Albert Einstein Hospital in Sao Paulo, where he underwent surgery to remove a colostomy bag following a near-fatal stabbing on the campaign trail in September. 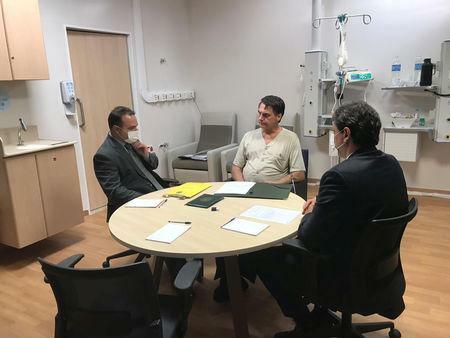 Initially expected to hospitalized be for 10 days, Bolsonaro contracted pneumonia, extending his stay. The hospital said in a statement on Tuesday that his health was gradually improving.